Chenbro Xpider Gaming Bomb (PC61166) (Cases) [Page: 1 of 2] - TACKtech Corp. The Chenbro Gaming Bomb (or Xpider as it is known in North America) is Chenbro’s first foray into the competitive world of computer cases made for the enthusiast, gamer or LAN-party goer. Does it live up to its goals? At this point we have to answer with a resounding YES. Read on to find out why and to discover whether this is the case for you. Established in 1983, Chenbro Micom Co., Ltd. has been specializing in the development of IT products, with the core business focus on PC cases, Server cases and Rackmount cases. Under our motto of competing with tomorrow, we rate highly on the research and development of products, quality improvement and equipment upgrade. This guides us to constant technical breakthroughs in face of the changes in time and trend. As a result, our corporation grows and expands. In 2001, our total sales revenue reached US$50 million. We set up offices in North America, Europe, Mainland China and Japan, with a team of 700 servicing staff all over the world. Product innovation and invention has always been our dynamic brand's essence. 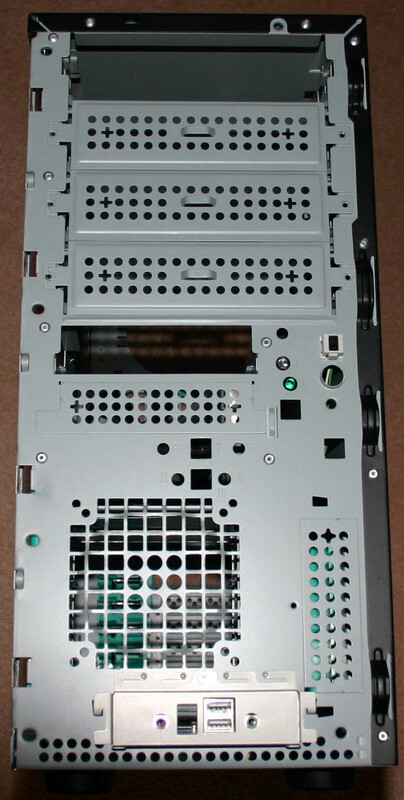 We invented the world's first tower pc, as well as the removable M/B tray, which is easy for maintenance. Besides, Chenbro is the business partner of the world's famous hi-tech manufacturers, such as Intel, Dell and IBM, etc. One of the successful projects includes working with Intel on the DP Xeon reference system design & SSI spec. initiative. In 2000, Chenbro actively extended the service scope to invest US$1 million in the construction of RAPID PROTOTYPING. Chenbro's high insistence in the technical reformation and the full-scope service provision applies to its steadfast leadership position within the IT field. The front facia is available in four different colours. They are orange, blue, grey and green. I received the orange version and I have to say that the paint job is impressive. The paint has a metallic quality and is generally very even. It is made of plastic yet manages to attain a solid feel and not look cheap. However, the Gaming Bomb’s front is very aggressively styled thus resulting in some people loving it and some hating it. There really is no middle ground and the styling seems to appeal to a younger customer base. Upon opening the box, I received varying comments from family members ranging from “Wow! That is so cool! Can I have it after the review is done?” to “You’re not seriously going to keep that in the house are you?” Personally, it is not in keeping with my sense of style and is a bit gaudy for me. The front facia is very wide with it curving outwards towards the middle and thus gives the case the appearance of being larger than it is. 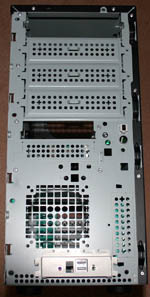 This case supports four external 5.25” bays and one 3.5” bay. This is certainly sufficient for most users but some (not including me) will find the lack of external 3.5” bays restrictive. The power button is of good quality and has a nice feel to it when being depressed. Unfortunately, this case doesn’t have a reset button. To some this may not be a problem but I find that I use this feature a lot and thus miss it. There are power and HDD LEDs as well. Moving along to the bottom half of the Gaming Bomb’s front facia, we see the “X” pattern that could be the reason behind the name Xpider. A plastic grill pattern is used for the intake and certainly looks very attractive. This will be covered further later on in the review. Under a flip cover at the bottom of the case two USB 2.0 ports, an audio in and microphone jack is hidden. While these are present on most cases recently, they provide a very useful function and it’s good to see that they’re not omitted.